A tanning bed is only effective with working lamps. Tanning bed lamps are rated to a certain number of usage hours before the manufacturer recommends that you change them. These usage hours are different for each model of lamp and for each manufacture. Your lamps have a manufacture usage rating of 1200 hours. 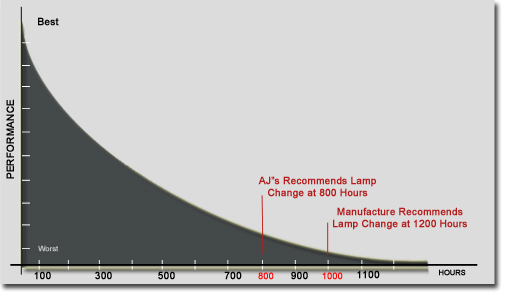 Through our experience, AJ's Tanning Sales & Service recommends that you change your lamps every 800 usage hours. We have found that after the 800 hour mark lamp performance decreases very rapidly, and your customers will notice a difference in their tan. Switch the lamp out with the neighboring bulb on either side, to test whether the problem is the bulb or the receptacle. If the problem is the receptacle, repeat the same test with the starters. The starter is a cylinder roughly the diameter of a penny. To remove the starter, grasp it firmly and turn it 1/2 turn counterclockwise. The starters are the most sensitive component of the bed, and are designed to protect the bed by burning out in case of an overload, rather than discharging into the bulb and damaging it. More often than not this will be the reason your lamp is out. To change your acrylics, remove the thumb screws on the hinge side of the bed. It is recommended that you remove your acrylic, and clean both the backside of the acrylic as well as your reflectors every 2 months. Only clean your bed with Ph Neutral, hypoallergenic disinfectant. Click HERE to purchase tanning bed cleaner from our catalog. Click HERE for instructions on how to clean a tanning bed.